This configuration allows me to wipe the system partition and reinstall Linux while keeping all my data and settings in “/home”, it works well when upgrading to new version of Ubuntu. I usually find that I can just install a new version on the root partition and it keeps all my applications and settings just fine. I have a few broken short cuts afterwards for applications that are no longer installed but it only takes a minute to reinstall them and get everything is back to normal. I’ll be backing up the /home partition to an external USB hard disk with rsync so there is no danger of losing all my data during the constant wiping and reinstalling. The upgrade took about an hour I would say, it downloaded a lot of packages as you would expect but it did it a really fast speed and I was impressed. I was also able to continue using Firefox during the upgrade, although in hindsight that may not have been wise. The system upgraded fine and I got the latest versions of all the programs I’m familiar with: Gimp, Rhythmbox and so on. I had to reboot for the update to finalize and it all looked good but was running very slowly for some reason. My hard disk was spinning away like crazy and obviously slowing things down, I have no idea what it was doing but I left it for a while and it carried on so I decided it was time to do as I normally would and go for a fresh install. There’s nothing wrong with upgrading and it works well for a lot of people, I just find it much easier to wipe my system drive and start again, it clears out any mess and seems to perform better. The 64bit experiment – As you may have noticed from my hardware specs I have an AMD 64bit CPU but I tend to run the 32bit versions of Ubuntu. I decided maybe I should give the 64bit version of Gutsy a try. I put the LiveCD into the drive and it booted up fine, everything seemed to be going well and I installed the system. This took about 20mins I would estimate but I wasn’t really counting so don’t quote me on that. At first glance the system didn’t look any different to the 32bit Ubuntu, all the applications were the same. It wasn’t any faster than the 32bit edition either, certainly not to the naked eye anyway. I had heard about lots of problems with installing Flash in Firefox on 64bit systems and the free alternative Gnash so I decided to investigate that. Sure enough I couldn’t install the official Flash 9 plugin from Macromedia so I went to Add/Remove on the menu and installed Gnash. It didn’t seem to make any difference though as I still couldn’t load any Flash content in my browser which was frustrating. I did some research and found there are ways to install the 32 bit edition of Firefox on top of your 64bit system but they looked a little complicated and besides doesn’t this defeat the purpose of a 64bit system? I thought so anyway. I also couldn’t install Skype which is a nasty proprietary closed system I know but sadly it’s a nasty closed system that everyone uses and I need it. Apparently there is a way to install the 32bit Skype using some 32bit libraries and stuff but at this point it seemed like everything was a work around in the 64bit system and it didn’t seem worth it. If it had been significantly faster then I may have persevered but there didn’t seem to be a pay off for me. Third Time Lucky – So this time it was on to the normal 32bit version of Gutsy and things didn’t start too well I have to say. I booted the CD and after selecting “start or install” on the menu I hit a nice black screen reporting a kernel panic. Not good but a problem I have seen before. The error is something to do with APIC and I’ve had it before on Feisty and Edgy so luckily I knew how to deal with it. I had to manually disable APIC in the boot options. On the main install screen I pressed F6 to add options and entered the word “noapic” at the end of the line, then pressed return. This prevents the installer from compiling APIC into the kernel and avoids the problem. Normally this would have been the end of the problems but then I encountered an error I have never seen before. I got this serious looking red dialog box after starting the install, it said “I/O error: Error Reading Boot CD” and had a reboot button. I tried the CD another time and got the same thing, I knew the media was ok so I was a little worried at this point. Just out of blind hope really I took the CD out of the draw and cleaned it thoroughly in case there was smudge on it or something. Thankfully this worked and at the next attempt the CD ran perfectly. Phew!! I always choose manual partitioning because I like to have full control over my drives and I also like to put my home folder on it’s own partition as I mentioned earlier. In the shot above you can see the manual set up screen. My drive was already partitioned but you could create new partitions easily here to match this if need be. I set hda2 which is my small partition to reformat by ticking the box and then I use the “edit partition” button to set the mount point to “/” which will be the system root. Next I use the “edit partition” button again on hda1 which is my largest partition, I set it to mount at /home and ensure it’s not set to reformat in my case. I have all my data on here and obviously I don’t want to wipe it. If I were setting up a system with a new drive then I would let it format. The third partition can be left as it is, it’s the swap partition for the system which is common in all Linux distributions and helps performance. That’s pretty much it, you can have a look through the rest of the screens on Flickr if you like, it’s all stuff like user name setting and so on. 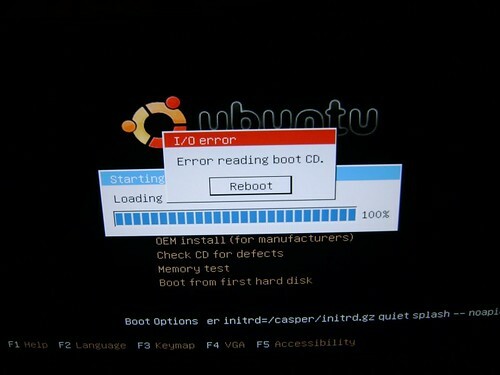 Finally after the system had installed I hit the reboot screen and was prompted to remove the CD. After rebooting and logging into the new system I was presented with the restricted driver manager. I visited YouTube and was prompted to automatically install Flash in a few clicks. Everything was going well. I installed Vmware Server from source using this guide and it worked fine as you can see below. So what is Gutsy like I hear you ask, to be honest it’s pretty much exactly like Feisty. There’s more polish and a few new features to enjoy but most of it is the same Ubuntu I know and love. I’m in two minds about this because I wanted to see lots of new things but then there was not a lot wrong with Feisty anyway. One thing that did annoy me a little was having to dig around in obscure menus to find the 3D effects but this was partly ignorance on my part. I have to say though that I think if you’re installing the restricted video drivers there’s only really one reason you would do that… 3D effects!! 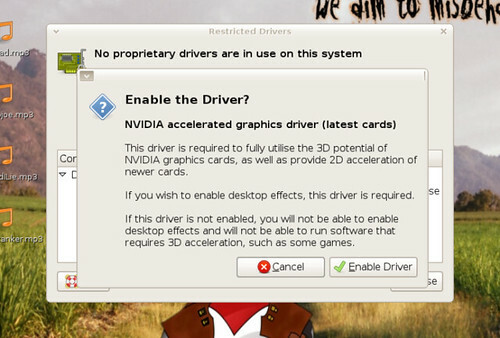 So why not give an option to enable the effects automatically when you install the restricted driver? Just a suggestion. Great read Dan! Thanks for the time and effort on this. I look forward to reading about the rest of your adventure through the various Linux distros. 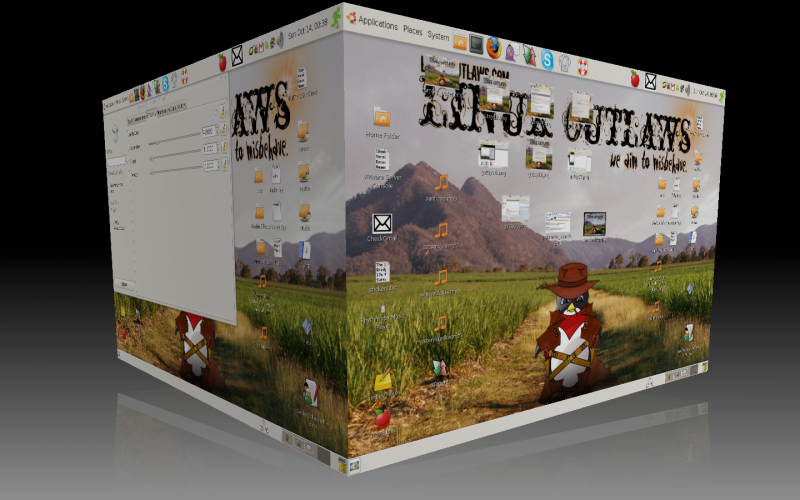 I am using adobe flash 9 on gutsy without any problems using the ubuntu package. All you need to do is install flashplugin-nonfree and installs nspluginwrapper which allows you to use 32 bit plugins with a 64 bit processor. Nothing much can be done about skype, you can install a 32bit chroot environment to run these proprietary applications. If it is important to run these unsupported third party applications you should stick with what you know but i run the 64 bit version without too many problems. That’s cool, as I said I’m sure Flash could have been fixed if I’d spent more time on it. Interestingly though I did do what you suggest and install the flashplugin-nonfree package at the time with Synaptic, it installed nspluginwrapper for me but I still couldn’t get any Flash content up in Firefox no matter what I did. I restarted the browser many times and tried to ensure that no conflicting packages like Gnash were installed but nothing seemed to work. I found some guides on the Ubuntu Forum but they didn’t do it for me. Upgraded from Feisty Fawn to Gutsy and now my Linksys WUSB54Gv4 USB wireless adapter stopped working. Was using the ndiswrapper workaround for Feisty Fawn… I’m keeping my eyes peeled on the Ubuntu forums for a workaround. Hmm that’s bad, I heard Gutsy had support for a few of those tricky Broadcom adapters out of the box. I hope they didn’t remove NDISWRAPPER because of that. I can see that they would but you never know. I have followed this series with real interest because it is very informative for new user such as myself. I am using Ubuntu 7.10 and your review is accurate save for a few details. Suspend and hibernate simply do not work in Gnome – period. This is critical for a laptop user (Mine is an Asus Z96J). There are several other minor problems but those are not critical. Maybe power management ought to be a standard point of comparison? Let me endorse adding PC-BSD to your list. An interesting alternative from the look of it. Thanks for the information William, good to know. I’m not a laptop user myself so I didn’t test out wireless or suspend/restore functions in these distros. I am getting a laptop soon so I’ll be able to fix that.